Salt, sugar, white peppercorns, and dill are all that’s needed to make the divine Scandinavian cured salmon dish known as gravlax. When I was in my twenties, I lived with a woman named Erika Worm (it’s pronounced vorm) who showed me the way around a professional kitchen. We lived in her family’s big house on a lake, and Erika cooked as if she were made for the task. As a result of her mom’s catering spell, not only was she blessed with the skills to rival a Top Chef, we had the run of a two-Viking-range kitchen with all the bells and whistles. I would watch her make dish after dish, probing her with questions about temperature, taste, and plating. Later in life, when I was the master of my own kitchen (read nonprofessional), I would try to replicate her dishes. One dish that stood out — one that did not even involve any cooking — was her recipe for gravlax. Gravlax, slices of salt and sugar–cured salmon that have lightly soaked up the essence of fresh dill, is actually quite easy to make, and I remembered this distinctly. I think Erika called it a no-brainer that looks really impressive on the buffet table. All one needs to do is obtain a fresh piece of salmon, preferably one with the skin still on, and with a close-to-uniform thickness (the center cut works best), rub it with the cure, cover it with fresh dill, and let it sit for a day. How’s that for a no-brainer? I can already hear the wheels spinning in your head. You’re asking yourself where you can buy the freshest piece of salmon because you want to make this for your New Year’s Day brunch. 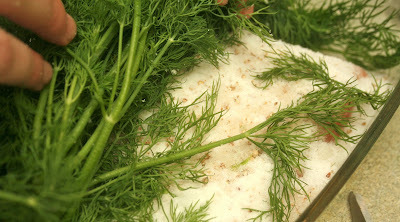 After you blanket the salmon with the salt and sugar cure, cover it with bunches of fresh dill. Slicing the gravlax once it’s cured is really the only tricky part. Just make sure you have a thin-bladed and extremely sharp knife at the ready. Have some chilled champagne ready, as you will want to serve your beautiful creation with some bubbly. We recently enjoyed some gravalax with a passion fruit bellini made with thawed passion fruit (maracuja in Portuguese or lilikoi in Hawaiian) puree we always get from a Brazilian shop on 46th Street in Manhattan called Buzios. It also comes in a bottle. You can probably get it at a specialty market that stocks ethnic foods, but if not, you may have to ask your grocer to stock it. In a bowl, mix the sugar, salt, and peppercorns (and any other spices if you are using them). 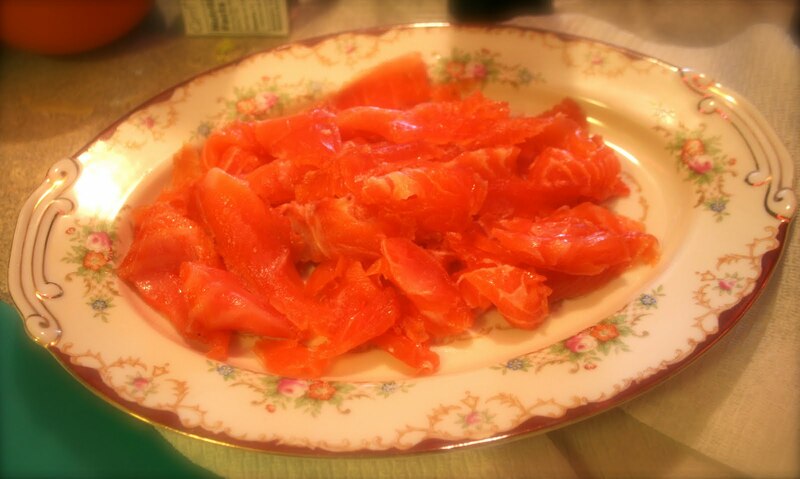 Place the salmon in a glass dish and remove any pin bones. You can locate them by running your fingers over the flesh where the natural separation occurs. Remove with your fingers or a pair of clean bottlenose pliers. Scoop up some of the mixture with your hand and rub all over the salmon, skin included. 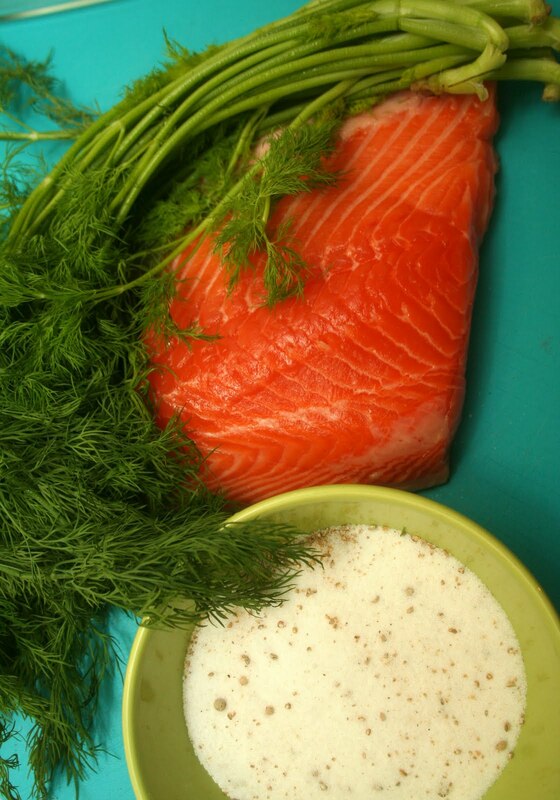 Place the salmon in a glass dish, and cover with the remainder of the mixture. Then, cover the salmon with the dill so that you don’s see any of the salmon. Press down gently. Let stand at room temperature for 5 hours, 6 maximum. Cover, and refrigerate for about 24–48 hours, the thicker the salmon, the longer the curing time. Remove the gravlax from the dish (it will be swimming in all the liquid the salt cure has leached from it, and it should smell slightly metallic and briny underneath the dill). 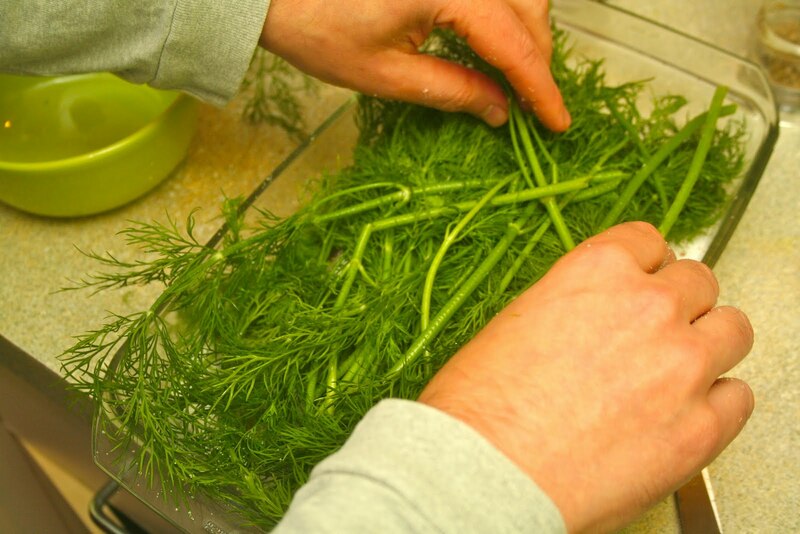 Discard the dill, and quickly rinse the gravlax under cold water until the mixture has been washed away. Do not saturate the gravlax. Place the gravlax on a cutting board and with a sharp knife cut thin slices across the grain. Serve with mustard dill sauce and slices of bagel, or brown bread, or crisp rye bread. Sides of capers, sliced red onion, and lettuce leaves will be appreciated as well. Best eaten within 4 days. In a bowl, or preferably a standing mixer, add all the ingredients except the oil. While mixing vigorously or with the mixer on high, slowly drizzle the oil in steadily. Mix until it thickens. In a champagne flute, add the passion fruit puree and the simple syrup. Top with chilled champagne. How beautiful. The Black Currant Sparkler gets its kick from Campari, the classic Italian aperitivo. If you’re familiar with Campari, that glowing red aperitivo that’s used in a classic Negroni and Americano, you know it pulls no punches. It’s either love at first sip, or, well, let’s not even go there. For you see, knowing how to mix this bittersweet orange amaro is a skill worth seeking out, and we have five recipes, from five of New York’s most noteworthy mixologists, sure to make your trip to the liquor store worth it. The lovely Hanna Lee, of Hanna Lee Communications, a lady who knows how to throw one helluva party, invited us to attend Campari’s “Life with a Twist: Aperitivo and Beyond” at NYC’s Silver Lining, where these five esteemed bartenders shook and stirred their creations for an eager crowd of thirsty (and hungry) imbibers. Creative and traditional food, along with some holiday flash, adorned each bar, and Campari revelers got the chance to chat with the men and women behind the sticks to find out how they came up with the recipes (each created three drinks). Paul got to shoot the breeze with Dushan Zaric, mastermind cocktail creator at Employees Only and the Macao Trading Co., whose Malena cocktail blew his mind. Dushan, who has a strong culinary background, revealed to Paul two secrets behind the success of this drink’s ever-changing long finish: using an easy-to-mix rye that does not impart too much oakiness, and the few drops of orange blossom (or orange flower) water that unite the ingredients, thus extending the finish. We tried making this at home with another rye just to see how different it could possibly be, and it indeed was. We will be using Wild Turkey 101 exclusively for this drink from now on. Steve spoke with the charming Christy Pope, of Cuffs & Buttons Cocktail Catering, who explained that she approached her dessert cocktails with a light hand on the sugar. Most of us associate dessert drinks with heavy cream and lots of sweet liqueurs, but Christy decided to focus on flavor rather than calorie content. 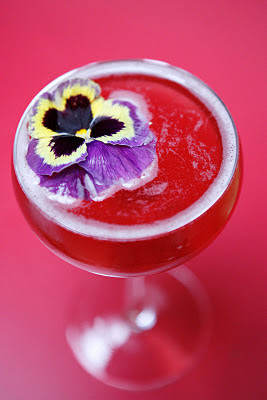 Her Black Currant Sparkler lit up the bar with its blend of gin, prosecco, and Campari, lightly embellished with a purple orchid and a spritz of white crème de cacao and vanilla extract to add aroma. Heavenly. So, if you love Campari, dive right in to these five glorious recipes, all perfect for different occasions. If you’ve had reservations in the past because you thought Campari was too bitter, don’t be afraid. You’ll wipe away these fears with a few sips of these masterly cocktails. 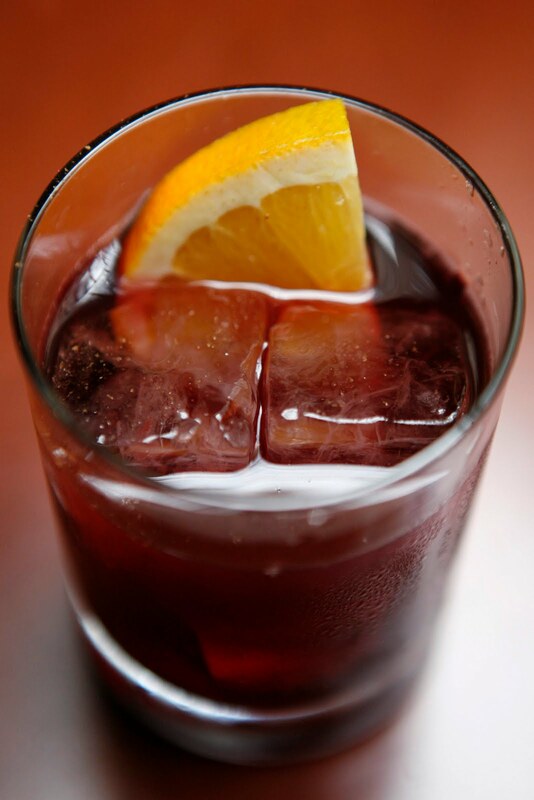 Place the roasted orange wedge in a mixing glass and add vermouth. Muddle the two so that the charred bits are released into the vermouth. Add Campari and ice, and shake hard. 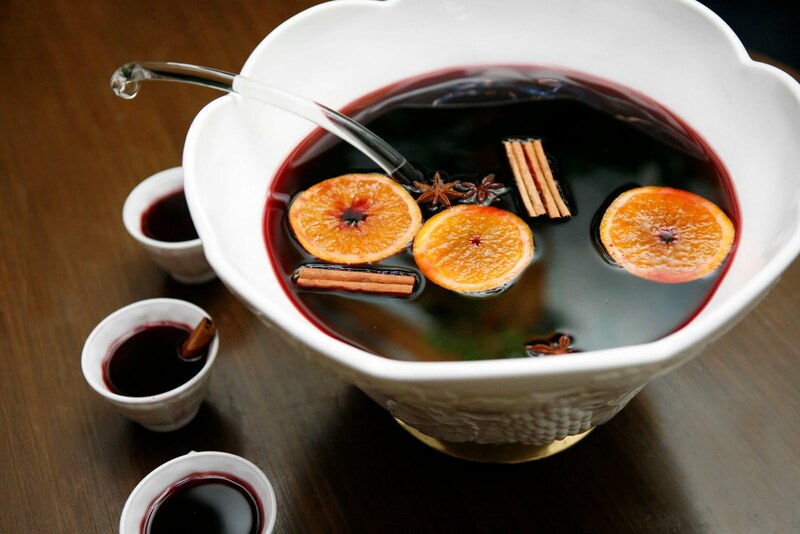 Strain into a wine glass filled with ice and add sparkling wine. Sort cranberries discarding bruised fruit. Rinse and place in a six-quart pan with raisins, orange zest, cinnamon sticks, whole cloves, allspice, nutmeg and cranberry juice. Bring to a boil over high heat, cover and simmer on low heat for 20 minutes to blend flavors. Add wine and sugar and heat until steaming (6-8 minutes). Do NOT bring to a boil. Add Campari, orange liqueur, and almond extract. Strain out cranberries and ladle into punch cups. Garnish with a cinnamon stick and star anise. Place ingredients (except champagne) in a mixing glass and shake hard with ice. Double strain into chilled champagne flute and top off with 2 ounce chilled brut champagne. Add a raspberry for garnish. *To make wildflower honey syrup, stir 1 part organic wildflower honey with 1 part hot water until honey has dissolved. Bottle and refrigerate. Place ingredients (except prosecco) in a mixing glass with ice and stir. Strain into a coupe glass and top with prosecco. 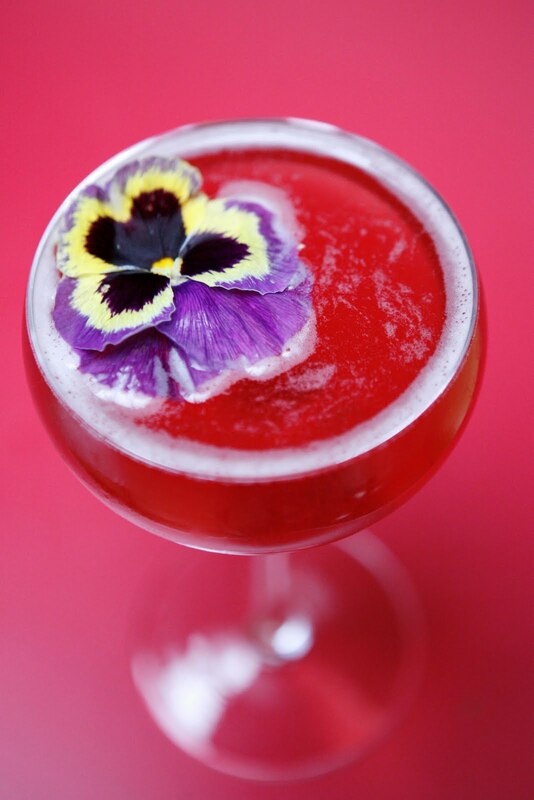 Garnish with an edible pansy. How does Campari get its unusual vermilion hue? 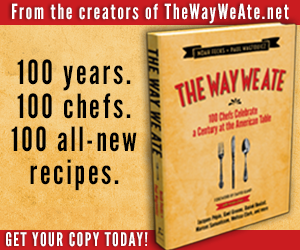 Well, originally the dye used to color it was derived from crushed cochineal insects. We can assure you that the bottles reaching American shores do not have such a distinction (at least that’s the word on the street—Campari, like any spirit that has managed to stay popular over the course of time, keeps its recipe hush-hush). Photos of cocktails courtesy of Hanna Lee Communications; photo of Campari bottle courtesy of Campari.com.